Innovative teachers, IT directors and Technology Integration Specialists are gearing up for the murky process of upgrading iPad deployments to iOS 5 in the coming weeks. Apple happily sells iPads to educational environments and offers paid engineering support, but there aren’t a specific set of tools designed specifically to support the granular control that IT departments, state & federal law, and school districts require. Download and update all software a day or two PRIOR to beginning your upgrade process. Day-of time savings: 3-8 hours depending on connectivity. Nothing is worse than jumping in ready to go and realizing you have hours of download time before starting! OSX 10.7 updates range from 50MB to a few hundred MB. Some (like the firmware updates) require a restart. iTunes updates are similar to OSX in terms of size. XCode is 4GB, unless you are upgrading to 4.2 (which is still 1.5GB). This software is free from the Mac Store and allows you to update multiple iPads at one time, instead of iTunes’ one-at-a-time process. Update all of the iPad apps that will be on each device. Some, like GarageBand are over 1GB. Updating iTunes and then pushing out the latest version saves you tons of time and bandwidth, as updating on each iPad takes n times longer (n = number of devices you are touching). Open iTunes without any devices connected to the computer. In the resulting window, select the “Devices” tab. Disable iPhoto’s import preparation assistance. Time savings: 15-150 minutes. If an iPad has photos on it, iPhoto will sometimes try to open and prep for an import. iPhoto will open, mount the device and then pull thumbnails in preparation to copy the files. This process can take 30 seconds for a few photos or minutes if there are a number of photos and video. Open iPhoto without any devices connected to the computer. 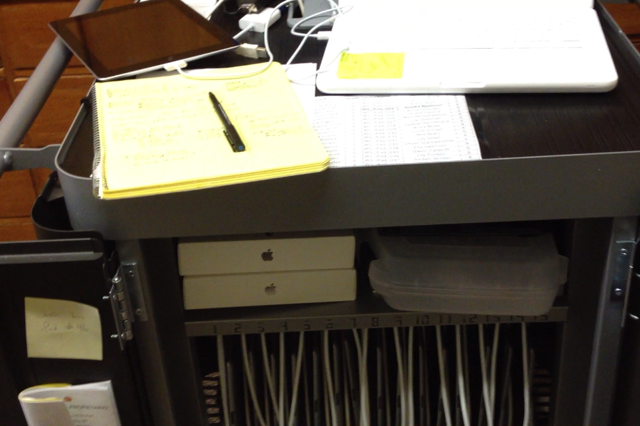 Have students deliver devices to the sync location, remove iPads from cases and label the cases clearly. Time savings: 15-30 minutes. Many hands make light work, and removing and documenting each 1-to-1 device can easily take 30 seconds to a minute for a single person. This tip is most valuable for larger scale deployments where students have their own cases, but is still useful for many-to-1 configurations. For anyone updating more than 5 iPads, use XCode for multiple concurrent iOS upgrades. Time savings: 1.25-4 hours. iTunes lets you update a single iPad and will then restore the device and wait for you to press a few buttons to start the next device. XCode (free software from the Mac Store) allows you to access and write to as many iPads as you like. Once a device is complete, it will appear in iTunes ready to be restored from a backup. iTunes will automatically use a unique identifier (UDID? Serial #?) to find the right backup for the particular iPad. This means you can begin the manual restoration process while other iPads are still upgrading their operating system. The entire process isn’t completely automated yet and still involves some clicking, but XCode definitely saves time. Thanks to Joseph Morelock and his team1 for the thorough documentation. Through all of this clicking at waiting, be sure to have other tasks at hand that require intermittent attention. Is your closet in need of a cleaning and reorganization? Have paperwork to file? Is it time to clean out your email inbox? Having someone else to chat with and talk through the process makes the time go by much more quickly. If you have 2 sync carts, then the two of you can even compete in IT jedi upgrade races. Thanks to @anotherschwab of SmallSchoolBigTech.com who served as my Twitter therapist as I worked through the process solo. Love that you documented these specific and easy to follow tips! Will pass this along to someone who will very shortly be in your shoes! THANK YOU for your posting. We are just in the beginning phases of implementing the iPads/carts and can use all the help we can get!